One Page WordPress theme uses popular “one-page” approach where all content is on one long page. When user clicks any of the menu items, she or he is not redirected to the another page. Instead, website scrolls down to the selected part of the single long page. Websites that have everything on a single page are relatively new trend in web design. 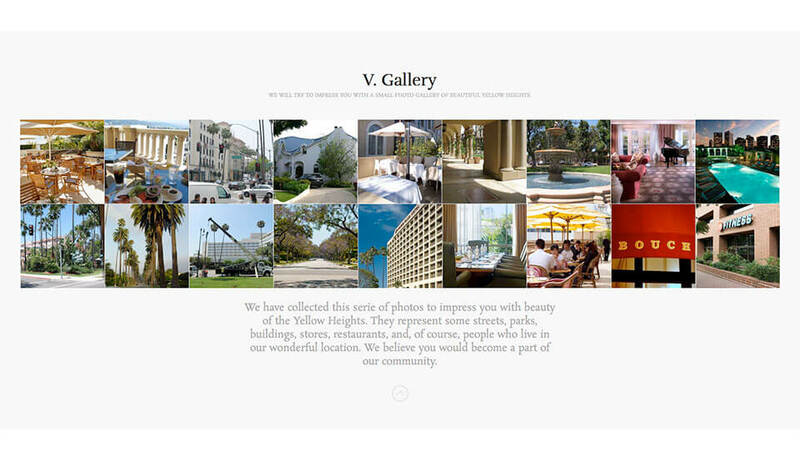 This approach is usually appropriate for smaller or portfolio websites. However, even more complex websites in some occasions can be developed using the single-page principles. The main advantage of this approach is that visitor has a feeling of ultra-fast loading of new content without any interruptions. Actually, a visitor of the one page website, have a feeling that he/she is using an application loaded directly into the browser. To make one page website properly, all you need is the One Page WordPress theme. This theme has been based on a clean design and can be used for many purposes. Altogether with this theme, you will get our new Hot Full Carousel plugin. It can be used for making the responsive slideshows for your site. The One Page WordPress theme is also equipped with several more useful plugins. Some of them are Hot Lightbox and Hot Simple Contact. How the One Page WordPress theme works? How to use it? First of all, it’s strongly recommended to start with the HotStart installation. It will copy the theme, all plugins and all demo data. Please read the documentation PDF for detailed instructions about the HotStart installation. The Hot One Page WordPress theme shows several posts on the home page. They are differently styled and some of these posts contain the widgets inside them (slideshow, ligthbox and tabs). The classic widget positions are only in the top area (logo, menu and big intro image) and in the bottom area (copyright text). It’s placed in the widget position “Header 1″. To change heading and small text, simply edit the textual widget. To change the default two images, the easiest way is to create 2 images and name them as “town_summer.jpg” (the first image) and “town_winter.jpg” (the second image). Then upload them both using the FTP to the folder /wp-content/themes/wp_hot_one_page/images/custom (overwrite original images). 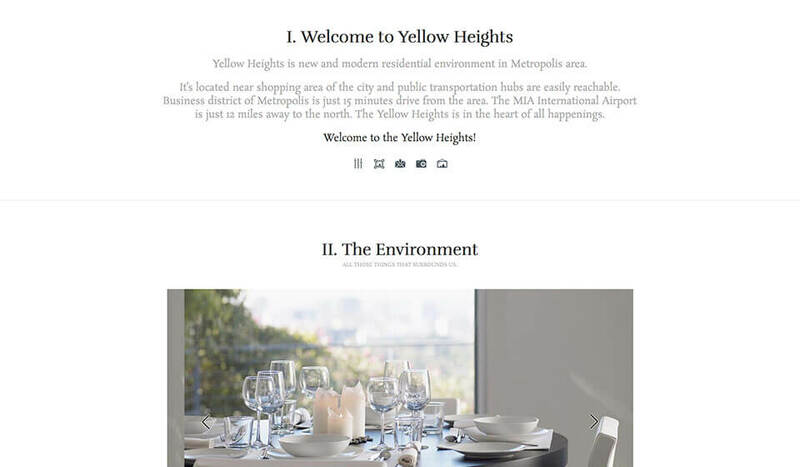 The One Page WordPress theme’s demo contains 6 posts and describes a fictional county of the Yellow Heights. We will describe each post here. We will also explain how each of the posts has been built. It will help you to understand how to edit them later. Welcome: A simple post with textual content. 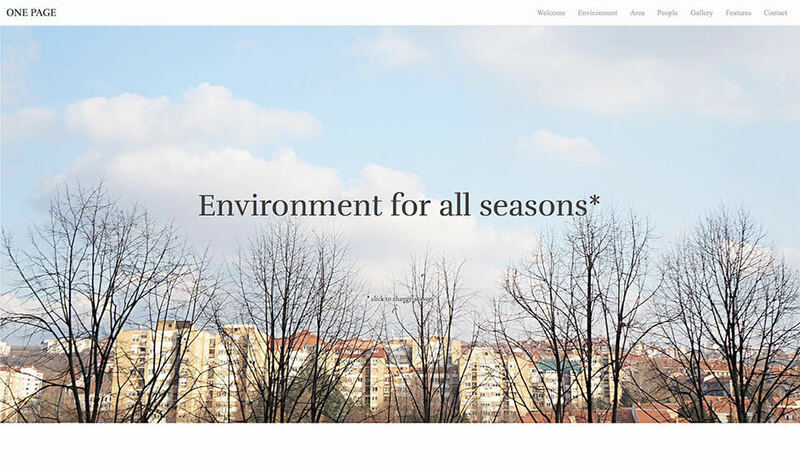 The Environment: It contains the Hot Full Carousel widget and some textual content. This widget ins published in the widget position “Hot Full Carousel” and it’s inserted into the post with “Widgets on Pages” plugin. When you edit this post, you’ll see the shortcode needed to load this widget into the post. The Neighborhood: A simple post with some textual content and images. 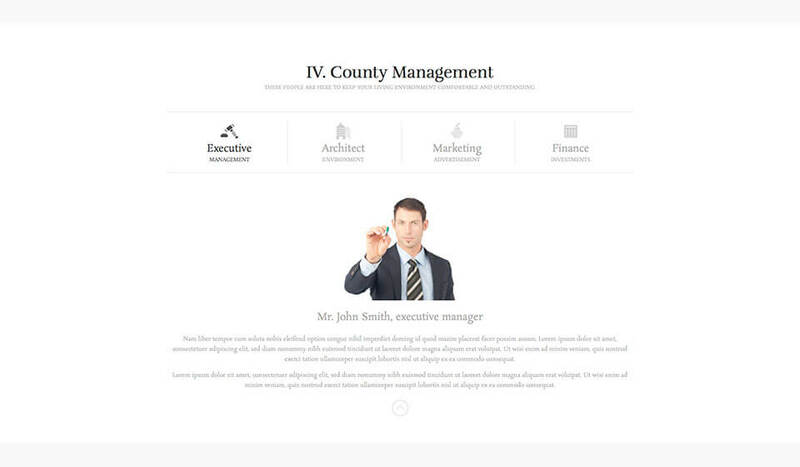 County Management: It’s recommended to edit this post in TEXT mode. This post contains 4 tabs. Click on each tab shows content for this tab. To create tabs, you should format your post properly. Basically, the tabs are in DIV container with ID “#tabs”. Inside it, there’s an unordered list (UL) with 4 elements (LI). Inside each LI element, there’s a link (A) with target (HREF) set to “#tabs-1”, “#tabs-2”, “#tabs-3” and “#tabs-4”. Inside each link element, there’s an icon image and heading of the tab. 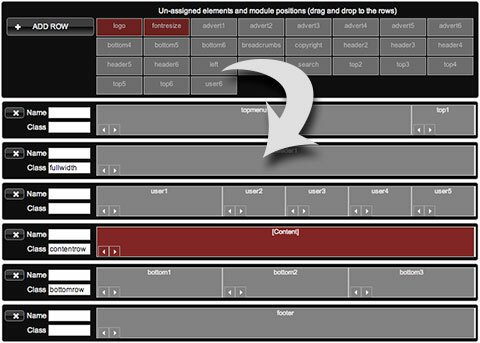 After the unordered list (UL) element, there are 4 DIV elements with ID set to “tabs-1”, “tabs-2”, “tabs-3” and “tabs-4”. Inside each of these DIV elements, you put content for your tabs (in our demo, it’s an image of a person and some text). Gallery: This post contains the Hot Lightbox widget (position “Hot Lightbox”) that’s inserted into the post with “Widgets on Pages” plugin (via shortcode – edit the post to see the shortcode). This post also contains some text. 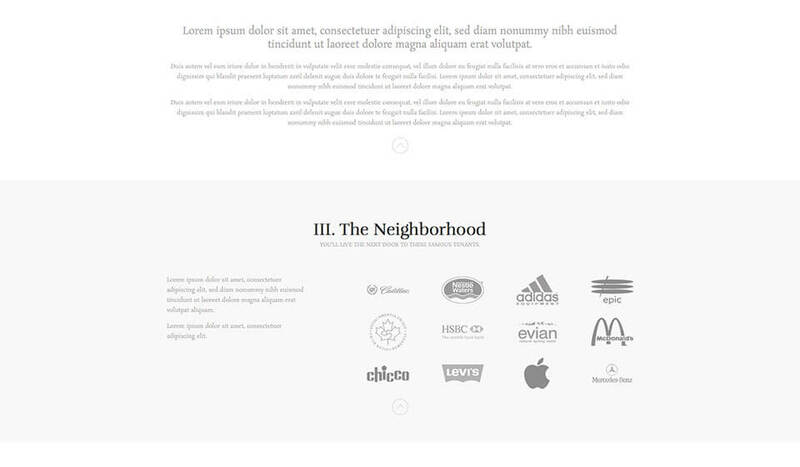 Theme Features: It’s made from the plain, HTML formatted text. Contact: This post contains the contact form. The form is created using the Hot Simple Contact plugin (published in widget position “Hot Simple Contact”). This plugin is also inserted into the post through the “Widgets on Pages” plugin. When you edit the post, if Visual tab is enabled, you can’t see it this tag. So, switch to the Text tab in the editor to see this tag. Once you have such tag in your post, then you can make menu items as on our demo. The menu items should be Custom Links type. The Link parameter should be (for this example): “http://yoursite.com/#environment”. You can use One Page WordPress theme to make normal single pages or posts too. You can do this as you usually do with any other theme. You just need to make a page or post and create a menu item that’s assigned to the page or post. The result can be seen in this sample single page. Layout of the One Page WordPress theme is based on the revolutionary Sparky Framework. 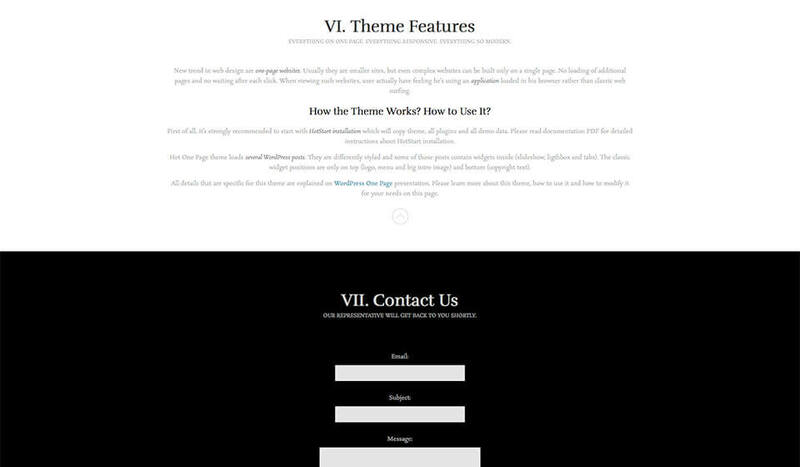 At the same time, it’s the first theme by HotThemes that uses fluid (100%) width. Actually, the width of the posts and pages has been limited to maximum 1140px (for better appearance). However, the header bar, the intro widget, the footer area and the Gallery page have a fluid width and occupy 100% of user’s screen space. 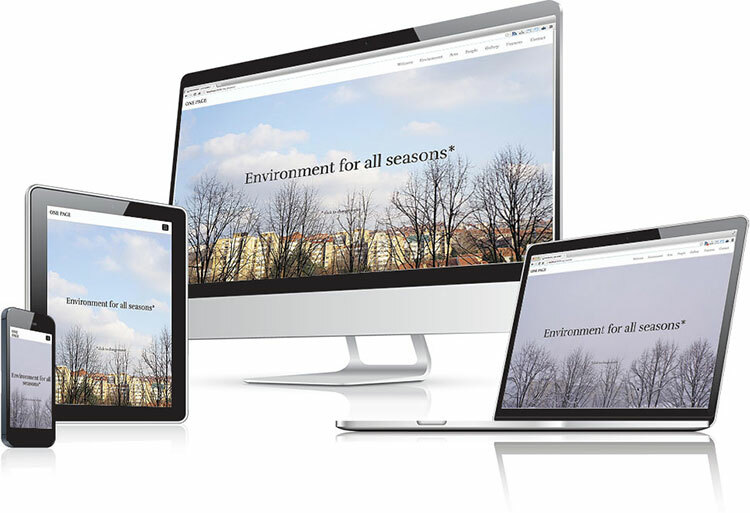 One Page WordPress theme is responsive! It looks beautiful and works fine on all devices and on all screen sizes. The typographic aspects of this design can be seen on the Typography page. It’s worth mentioning that all elements presented there can be used as shortcodes from the editor. Hot One Page is a responsive WordPress theme. This means it will look good and optimized on all desktop and notebook computers, as well as mobile devices (tablets and smartphones)! You have a full control over all colors used in the One Page WordPress theme. All font and background colors are parametrized. You can change them easily from the Sparky Framework’s control panel.